Help! I’m drowning in storage carrots! My family and I do love our carrots, but the storage ones tend to get a little bitter so I prefer those cooked rather than raw. What to do other soup, which has been voted off by husband and child. Carrot cake, ok, but not everyday fair. 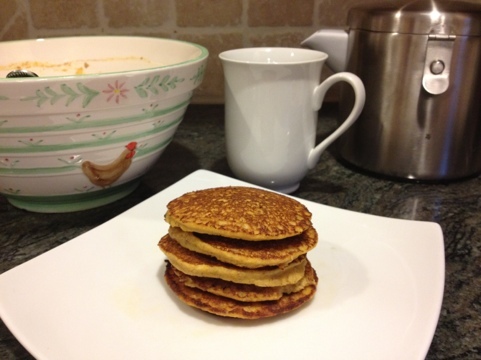 So let’s add some veggies to breakfast with carrot pancakes! The recipe is a modified one from Food Network. Whisk the wet ingredients and then stir in the dry and finally fold in the carrots. Fry in a skillet until golden brown. 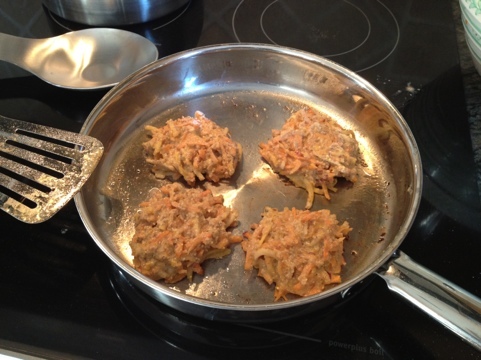 A few notes… They’re even better when frozen and then warmed up in the toasted oven as the carrots become more tender, Husband adds that these have a bit too much “roughage” in them, and we had a laugh because they looked more like potato latkes frying in the pan. Perhaps I was over eager to dispose of the carrot cornucopia?